Another train ride out from Marseille but from Blancarde station which still retains much of it's charm from the glory of the days of the Paris-Lyon-Marseille (PLM) era. The local TER train was packed with trippers, many of whom also got off at Bandol. The town was packed, Saturday was market day, and also changeover day for the hired boats and lodgings. There's a boulevard lined with palm trees and flowers along the side of the port, then a line of restauarnts. These were packed too so we did the picnic thing - the French now do that too, perhaps a sign of the times, "la crise". 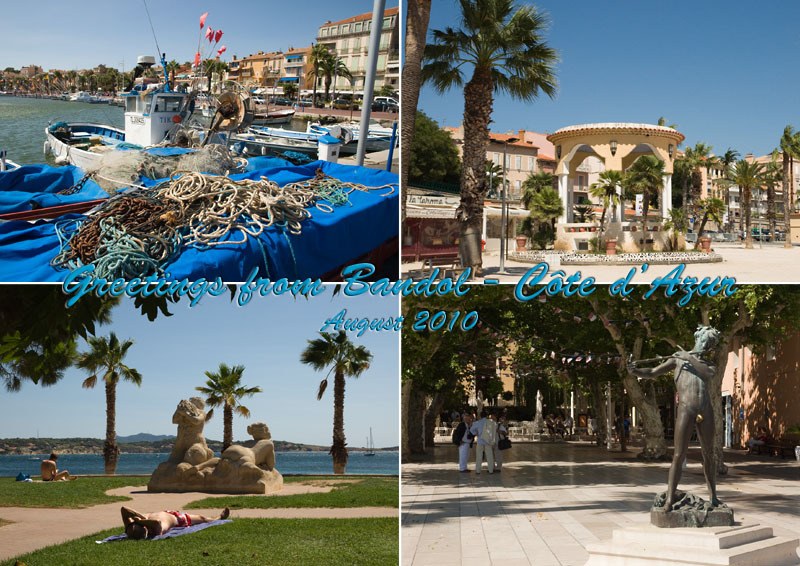 Wandering around, the town is a mixture of very expensive boats at a Provencal port and some kiss-me-quick restaurants in the street one row back from the boulevard, anmd a casino at the far end of the boulevard. But it's not St Tropez, although some visitors may like to think it is, - particularly the Parisians. The risqué art is part of the charm, although it's one of the places where there are signs and fashion police telling the visitors to stay clothed. Our trip back was marred by a 2½ hour delay on the train back, because of a fire between Bandol and Toulon, which closed the line. 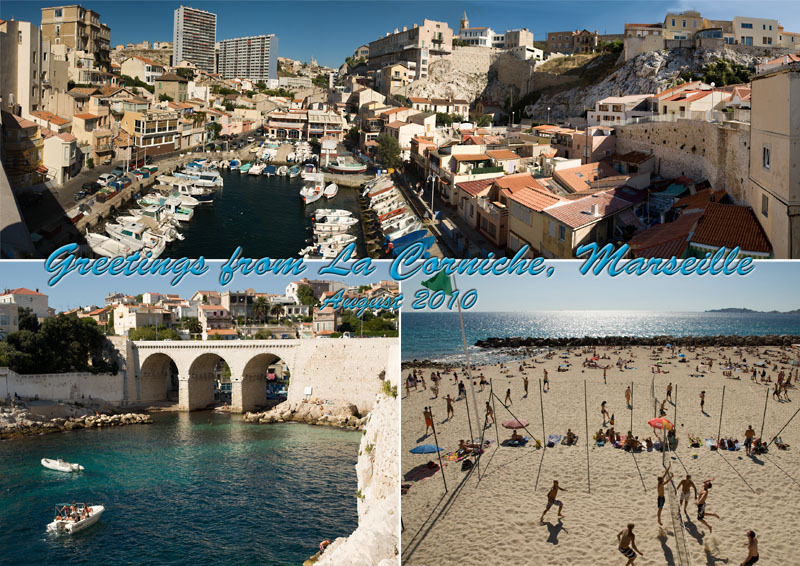 We took the Blue train to the Côte Bleu, the coast to the west of Marseille. The beaches changed from crowded semi-urban L'Estaque (where lived the impressionist painter Paul Cézanne) to the more exclusive harbours of Carry and Le Rouet, and some smaller semi-private ones between where you can still imagine the pirates.